Hawthorn Leadership School for GirlsToday We Learn. Tomorrow We Lead. Hawthorn Leadership School for Girls opened its doors in 2015 to 125 young women – the future leaders of St. Louis! Hawthorn has grown, adding a grade each year, and by 2020 we will be fully enrolled with 400 students in grades 6 – 12. 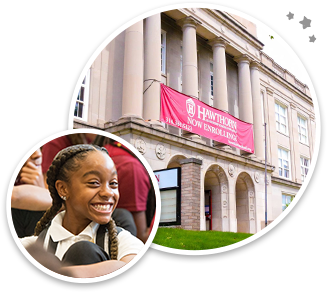 A college preparatory school with a focus on STEM (science technology, engineering and math), Hawthorn is preparing students for 21st-century careers. We teach our girls to be problem-solvers and collaborators, with confidence in technology tools. And our students gain confidence in themselves as students, citizens, friends and leaders. Hawthorn offers a unique learning environment, available to all girls living in the City of St. Louis. Small class sizes mean students get individual attention and opportunities to contribute. Committed and talented teachers create hands-on, engaging lessons, and build meaningful relationships with students. Each Hawthorn girl is known and valued. The Hawthorn sisterhood is our “special sauce.” Our girls form tight bonds with each other. Free to be themselves, they grow to appreciate differences and celebrate strengths. Hawthorn is a place of learning, but it is infused with joy, opportunities for bonding, and meaningful traditions. Hawthorn is committed to preparing students for post-secondary success. This happens through academic growth and also through co-curricular activities from basketball to choir, Homecoming Dance to community service. Our Dean of Students, College Counselor and Student Support Team, along with the rest of the staff, understand that our students’ interests, areas for growth and self-actualization extend beyond the classroom. Dear Future Self As Hawthorn girls begin to enter high school and look toward their future, we asked the student body to write themselves a letter to be entered into a time capsule to be opened at graduation. Listen to the girls give themselves advice and imagine what life will be like as a senior leaving Hawthorn Leadership School for Girls.